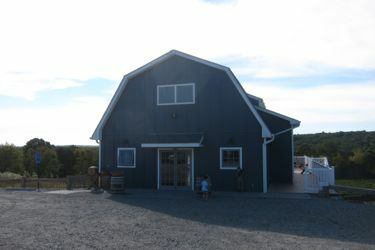 We had tried to visit this winery a few times since it opened only to be stymied by a wedding. This place was built as much for weddings as for wine tastings and such. 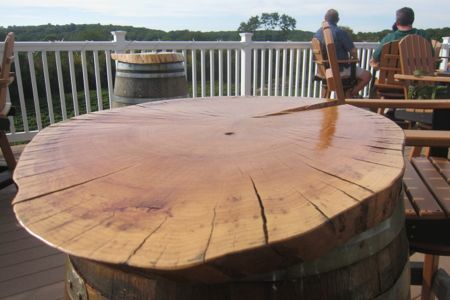 Which is great for them, and since they are new to the Connecticut wine scene, I give them a pass until they can sort out their open/closing times a bit better. So as we pulled into the driveway off of a very rural road in Preston, I was quite happy to see the OPEN flag a-fluttering. For this would be our penultimate state winery! Until any new ones open in 2015 and beyond, I was nearing the completion of a list on my website. And I’ll be honest with you, list-completion excitement outpaces wine tasting excitement for me. It just does. Hoang and I had our sons with us, which of course isn’t ideal for such things, but we’re old pros at this stuff. As we entered, though, the other patrons all sort of just stared at us. Are there no Asians in Preston? Biracial kids? Did I have some food stuck on my face? I have no idea. The tasting room is beautiful. The location up on a small ridge overlooking the vineyard and the wedding area really sets the tone for a good round of wine. Some guy was playing some acoustic countrified music upon arrival, and perhaps his countrified fans thought our kids would ruin their enjoyment of such terrible music. We settled in to an empty table at the back of the room, occupied the boys and I set about getting a tasting. Eight bucks for 5 micro pours – not unheard of, but not the cheapest either. Preston Ridge does offer patrons a nice selection of wines to choose from for their tasting, and also provides a pretty cool sheet that lists “suggested flights” of wines. This allows people who prefer certain styles to stick to what they like. Not many wineries have the capacity or variety to allow for this. I chose 5 wines and got my first micro pour to share/give to Hoang. I will admit we wanted to get through the tasting much quicker than most people, simply because of the kids. I will admit that I was distracted because of the kids. I will admit that I don’t really care about the nuances of Connecticut (and New York grape additions) wines, because after 30+ Connecticut wineries, you come to realize 90% of them are all the same grapes and all have the same taste. And unfortunately, that taste is never really all that great. Hey, did I mention the deck? It’s super nice. And the deck furniture was unique and really, really cool. Preston Ridge has put a lot of effort into their tasting room and it shows. It’s very well appointed, very comfortable, and allows for a ton of natural light to stream into it. By the second micro taste, Hoang and I were noting that we found the wines here entirely forgettable. Around that time, a kindly woman took notice of us and our kids and made small talk and offered the boys some chocolates. 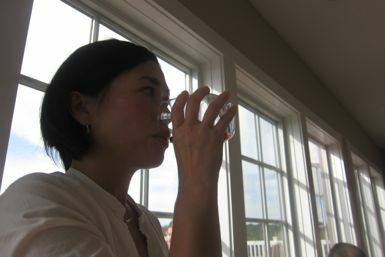 After Hoang made a face after tasting the Riesling, the woman was even nicer to us and began explaining certain aspects of the property. Oops. That woman was an owner. 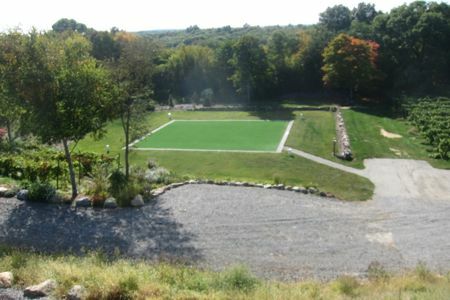 That green patch of astroturf is where people get married. Neither of the last two micro pours are worth mentioning, so I won’t. Hey, what can I say? We didn’t like the wine here. And I also didn’t really appreciate the server who a) clearly wanted nothing to do with a family who brought kids and b) was rather annoyed that she’d give me the spiel about the wine and then I’d just go and hand it to my wife who didn’t hear the spiel. Like it mattered. We had a sheet in front of us that clearly described each wine very well. Look, I get it. We are not your target customers. 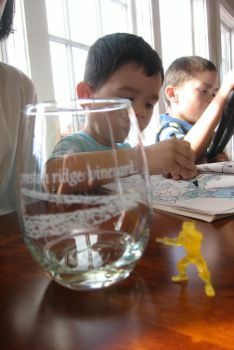 We live far away for one, and we dared to bring small children to your tasting room. I’ve never really been turned off by wineries or breweries who don’t love kids in their establishments. Really. It makes sense. But the attitude of the server lady and the quality of the wines did turn me off. Which is a shame, because the owner lady was as sweet as pie and the building and grounds are beautiful. I’m sure they will work out the kinks in the future because again, this place is brand new. And did I mention expensive? I’m staring at their pricing sheet and their bottles range from $18 to $37. 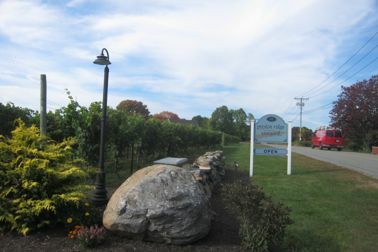 For Connecticut wine. I’m all about supporting local and independent, and if people are buying this stuff at those prices, that’s fantastic. But for my amateur palate, I can buy 3 bottles of delicious New Zealand wine for $37. So that’s what I’ll continue to do. yeah… i discovered long ago that there’s a really good reason that connecticut is not considered one of the great wine-growing regions of the world. i brought a bottle of [connecticut vineyard name redacted] chardonnay to a thanksgiving party once. i actually poured it down the sink when i tasted it in comparison to the other wines people brought. all the other wines.